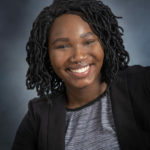 In the past two years in her role as District Equity Coach for the Fond du Lac School District, there is much to be said about Shavana Talbert’s accomplishments. She is solely responsible for the coordination of social justice, cultural and linguistic responsiveness and equity initiatives within the Fond du Lac School District, the 18th largest district in the state with over 7,000 students. In addition, her leadership is having an impact at the state level with her involvement in the Department of Public Instruction’s (DPI) Coaching Collaborative where she provides feedback on the development of statewide coaching tools and competencies. Talbert also services as an Assistant Coach for the Fond du Lac High School Varsity Girls’ Track and Field team, bartender at Thelma Sadoff Center for the Arts, and big sister for Big Brothers Big Sisters of Fond du Lac County. She is a board member for the Fond du Lac Area Women’s Fund and Fond du Lac Family YMCA in addition to being actively involved in Ebony Vision and YPF.